Formed on 23rd June 2001, Enfield Town FC started life in the Essex Senior League in 2001-02. The club finished runners-up in that first season before winning the league championship the following year. Their time spent in the ESL was successful, with two championships, two league cups, a Middlesex Charity Cup and wins in the Gordon Brasted Memorial Trophy and Capital Counties Feeder Leagues Trophy finals to show for their efforts. Following promotion to the Southern League (East) in 2005, the Towners had a terrific first season at that level, before eventually losing to Wivenhoe Town in the promotion play-offs. The following season, following a move into the Ryman League for 2006-07, the club again finished 3rd – this time losing out via the play-offs to AFC Sudbury. In 2009-10, the club yet again only just missed out on promotion, being beaten this time by Concord Rangers in the play-off final. The club originally played at Brimsdown Rovers' Goldsdown Road ground in a ground share arrangement. In October 2008, however, Enfield Council announced a deal with the club allowing it to relocate to the Queen Elizabeth II Stadium. 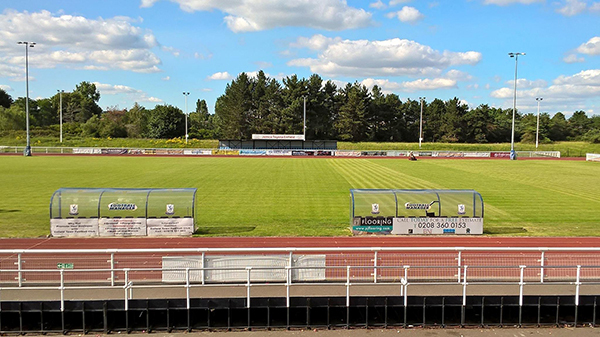 Realising a long held dream, the club worked closely with the Council to see the old athletics stadium restored and upgraded to be able to host Ryman League football. This finally provided the club with a home of its own a short distance from the former stadium in Southbury Road, with a capacity of 2,500. While retaining a running track as a training facility for local use, the club has been able to provide an atmospheric environment. The Stadium was formally opened in November 2011 with a match against a Tottenham Hotspur XI. Following the move to the new ground, there was a close Ryman 1 (North) title race between Town and eventual champions Leiston. After finishing as runners-up, Town had to settle for promotion the hard way, beating Grays Athletic and Needham Market in two exciting play-off games. After a period of consolidation at Step 3 had turned into a battle for survival, safety was only secured on the final day of the 2013-14 season with a 2-1 away win at Cray Wanderers. Bradley Quinton succeeded George Borg as first team manager in August 2014 and, during his first few months at the helm, the team recorded impressive 3-0 wins at Hendon, Maidstone and Margate, all of whom were either promoted or reached the play-offs. Indeed, such was the team’s improvement that a play-off place was achieved, only for 3 crucial points to be deducted towards the end of the campaign, in controversial circumstances, leading to a final league placing of 7th. In 2015/16, Town went on a terrific late run and only missed out on a play-off spot by a couple of points. Then last season, the play off dream was finally realised, but a 2-4 defeat at Dulwich Hamlet in the semi-final prevented further progress. Following the departure of manager Bradley Quinton to Braintree Town during the close season, the experienced Andy Leese took over the managerial reins, with former Premier League star Darren Purse as his assistant. The first supporter-owned club in the country, growth continues at a sustainable pace. Over the last few years, successful Reserve, Under-21, Under-18 and Ladies sides have been built, along with a number of other teams of various age groups and abilities, including a learning difficulties squad. With a view to their origins, in 2012 the club embarked on the Enfield Football Tales Project. With the help of a national charity, the Beth Johnson Foundation, lottery funding was obtained and a number of individuals and organisations came together with the intention of gathering people’s recollections of football in Enfield. A number of players, past and present, fans and officials kindly agreed to be interviewed and these have been uploaded onto YouTube and can be viewed via the Enfield Football Tales project’s website. A mobile exhibition has been created together with two handling boxes which can be used in conjunction with school visits and with those suffering the early stages of dementia. A team of volunteers are also involved in giving talks to local schools and organisations who are interested in either the sporting or the local history aspect of the project. These can be arranged by contact page on the tales website.